I'd Like to Live Here! Executed in 1955. This work is unique. M. Rooks and L. Warren, H.C. Westermann: Exhibition Catalogue and Catlogue Raisonné of Objects, New York, 2001, p. 82, no. 3 (illustrated in color) and p. 217 (illustrated). Chicago, Museum of Contemporary Art and Los Angeles County Museum, H.C. Westermann, January 1968-January 1969, pg. 15, no. 1 (illustrated). New York, Whitney Museum of American Art; New Orleans Museum of Art; Des Moines Art Center; Seattle Art Museum, and San Francisco Museum of Modern Art, H.C. Westermann, May 1978-May 1979, p. 16 (illustrated). Akron Art Museum, H.C. Westermann, January-March 1982. Serpentine Gallery, London, Arts Council of Great Britain, Westermann at the Serpentine, November 1980-February 1981, no. 1 (illustrated). 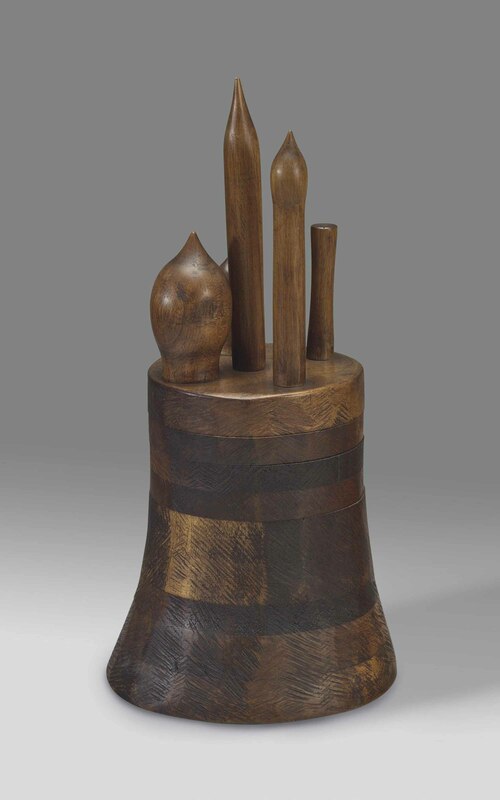 Philadelphia Art Alliance, Forms in Wood, April-May 1985. Chicago, Museum of Contemporary Art; Washington, D.C., Hirshhorn Museum and Sculpture Garden; Los Angeles, Museum of Contemporary Art, and Houston, Menil Collection, H.C. Westermann, June 2001-January 2003, p. 190, no. 2.